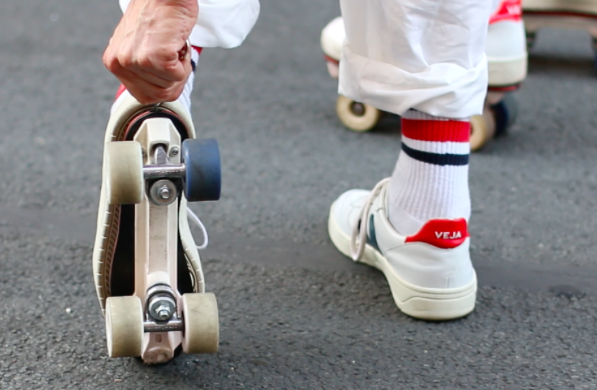 Flaneurz offer new “prêt à rouler” clip on skates with a brand you’ve surely heard of : Veja.What defines Veja are its ethicals, responsibles sneakers which are environmentally friendly and concerned with its producers and users. The Veja X Flaneurz adventure started in June 2015. Back then, Veja was already one of the first brand that had faith in us! Veja’s concept store “Centre Commercial” commercialized the Pantanal model, a dress shoe, during it’s 2012-2013 fall/winter collection. 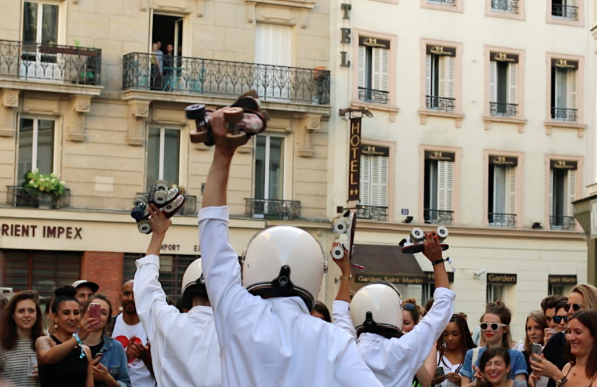 This model was turned into Flaneurz rollerskates during our crowdfunding campaign on Kickstarter. This joint adventure is now taking an even greater and stronger dimension. Side by side, our two brands co-conceived one of the new models of our Spring Summer 2017 collection : Veja X Flaneurz. The shoe is manufactured with organic cotton, cultivated by local producers without pesticides or fertilizers, in Brazil. The leather is tanned with plant extract and the sole is made of natural rubber from Amazon. The rolling part features the color coding of the shoe and completes it. 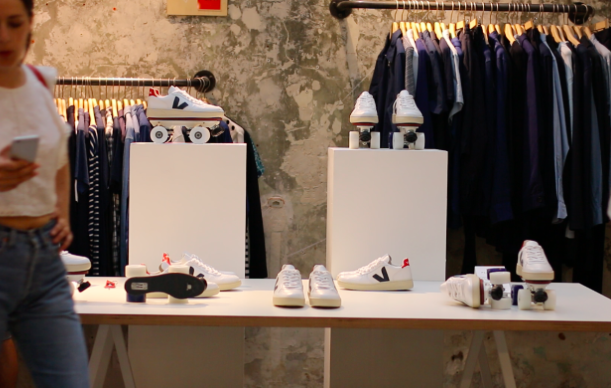 The choice of colors and finishing touches is the result of work in common between Veja and Flaneurz design offices. 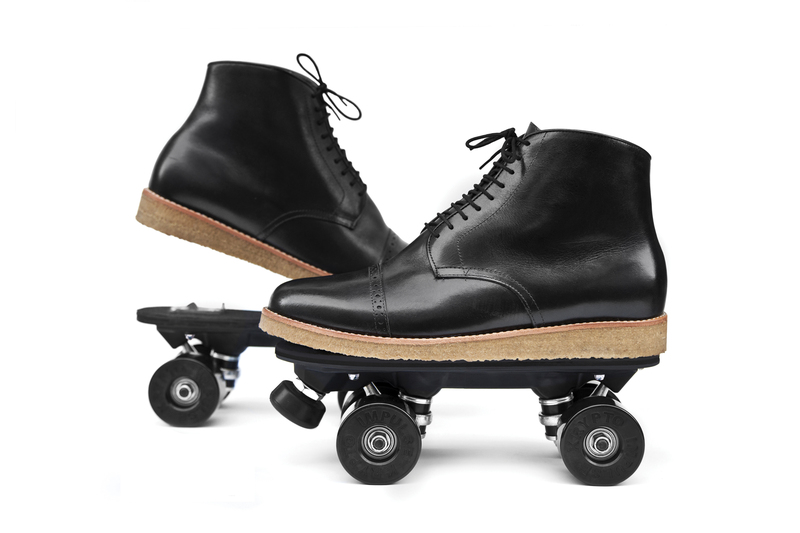 Light and all surfaces, those clip on skates are ideal for urban mobility, leisure and exploration. Flaneurz won a poster campaign in Paris. Bringing to light the Spring/Summer 2017 flagship model is obvious! From 19th April to 26th April, you will have the chance to admire those posters in Paris. 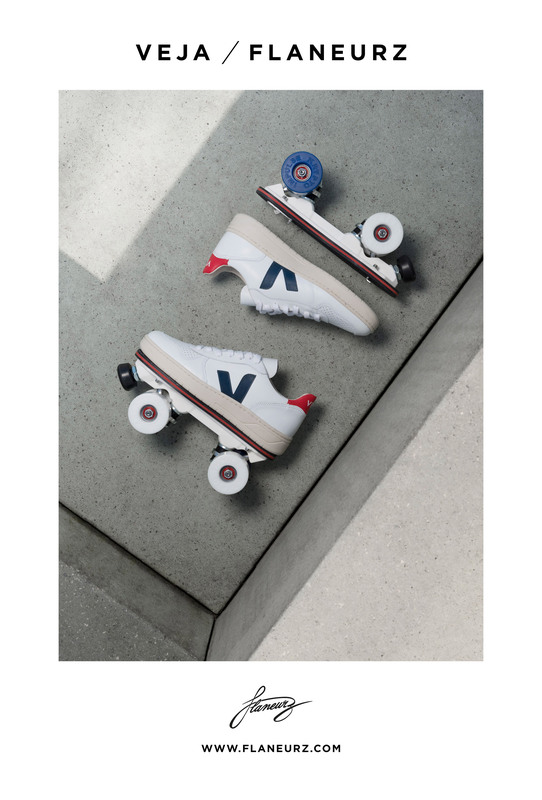 This collection is now available on the e-shops of Veja, Flaneurz, and in partner stores (Colette, Merci, Galeries Lafayette in Paris, Alex Eagle in Londres, Anthom in New York, Smart Fashion in Miami, Bailian in Shanghaï, Kapok in Hong Kong). Friday 06/23/2017 Flaneurz and Veja were inviting you to the launching party of their collaboration. 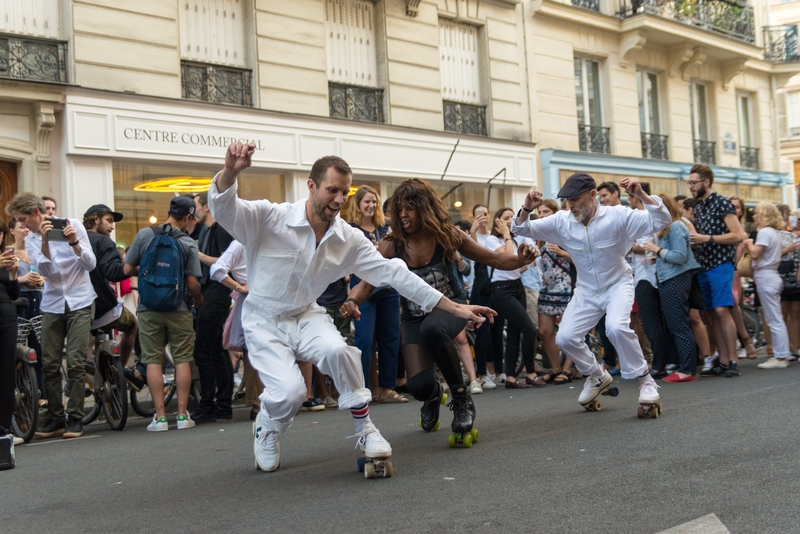 The occasion to discover these iconic shoes, designed as roller skates in one of the most prestigious fashion boutique of Paris : Centre Commercial. 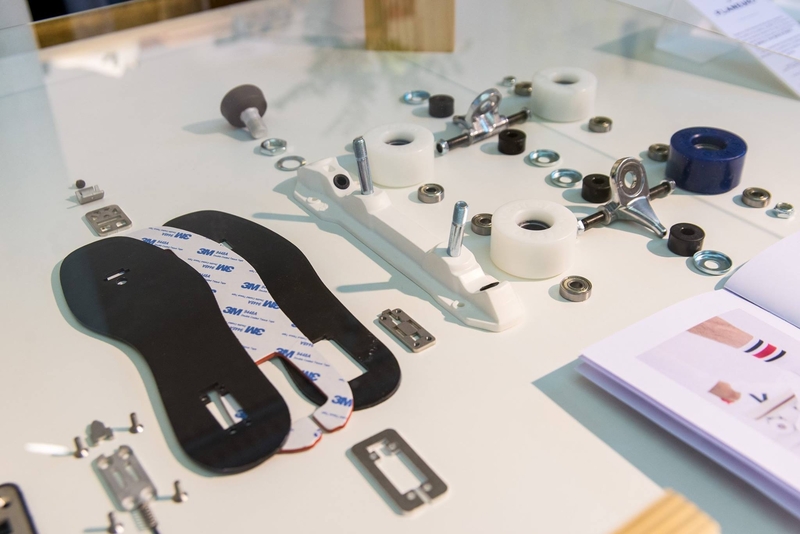 The expertise of both brands was presented to you through an exposition of each component of the On Wheelz mechanical system. It was a beautiful evening. 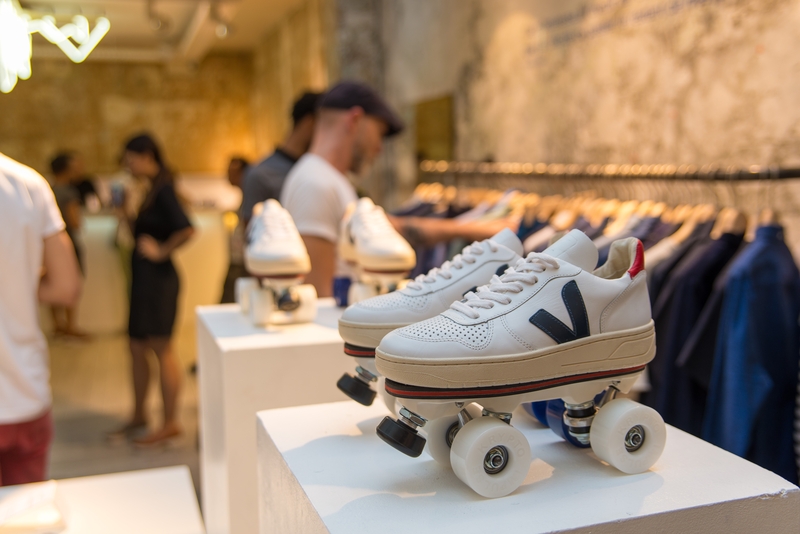 We loved seeing you on this occasion, watch, touch, try the Veja X Flaneurz model, but also drink, laugh, and be enchanted about the rollerdance show by the SkateXpress crew. You all made us proud. Thank you.